What is the flat iron you may ask? 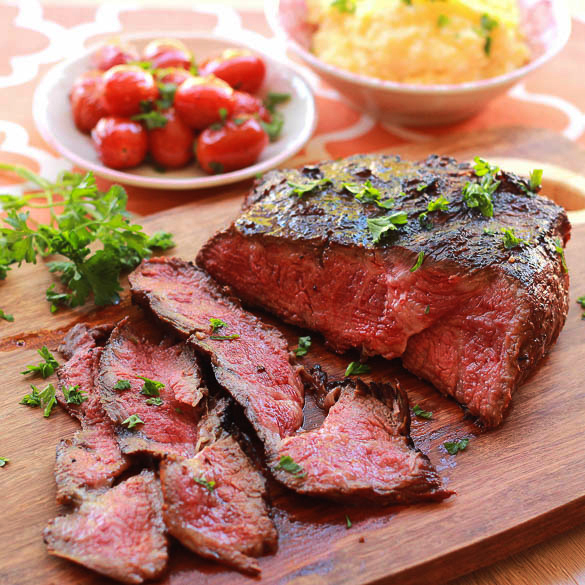 The Flat Iron steak is a relatively new cut of steak from the shoulder of a cow. 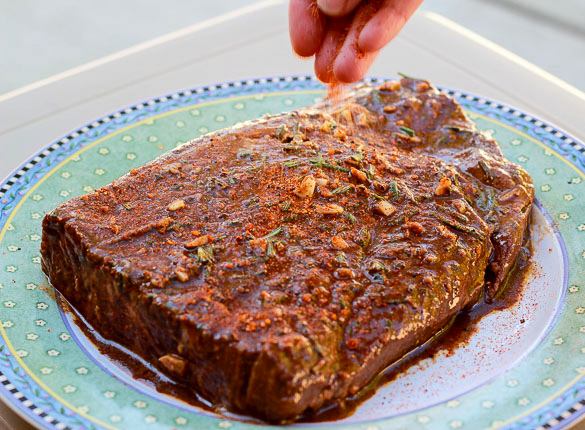 It’s the second most tender beef muscle and was introduced in 2002 after researches at the University of Nebraska and the University of Florida discovered this cut from the chuck shoulder clod top blade roast. You may have seen it on an upscale restaurant menu and it often surprises and impresses beef lovers with its intense flavor, juiciness, and marbling. 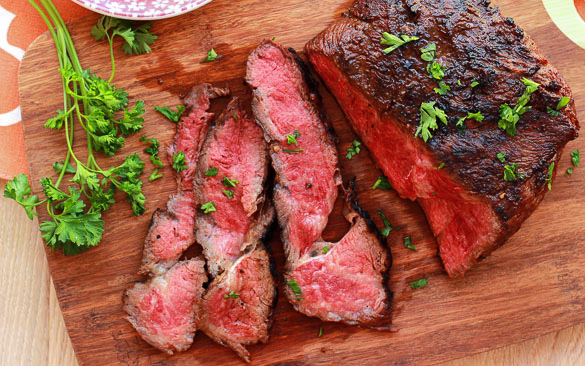 Sometime around 2008, chefs caught wind of this cut and it started appearing on menus of American steak houses and it continues to grow in popularity. You may see this cut of meat displayed in butcher shops as a "top blade" roast. Especially popular are flat irons from Wagyu beef. Due to the gracious folks at Snake River Farms, I’ve been able to develop a couple of delicious recipes to prepare flat iron steaks. Snake River Farm’s premium Gold Grade meats have the highest level of marbling that they offer in their American Kobe line and the flavor of their SRF flat iron steak is sure to please all true beef connoisseurs. With such a tender cut of beef, I did not try to do much to it besides a short marinade in crushed garlic, Djon mustard, and balsamic vinegar to give the beef a flavor boost. I used my SYD Beef Rub which won 1st Place USA in the 2010 and 2011 KCBS National Beef contests. 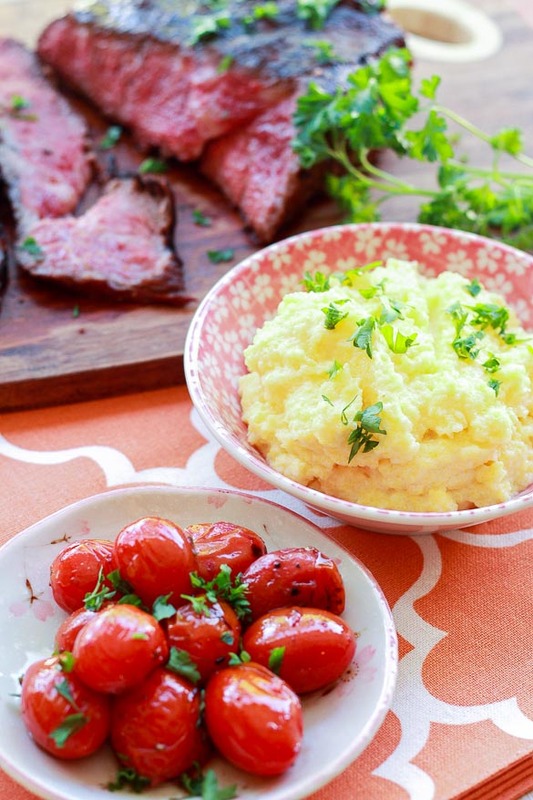 To showcase this steak, I added a supporting cast of creamy cheesy polenta, roasted whole tomatoes, and Italian parsley garnish. To make the polenta, in a pot over medium heat, bring the 2 cups milk, 1 cup cream, ½ stick of butter, and garlic paste to a simmer for 5 minutes. Add the polenta in a slow stream, whisking constantly. 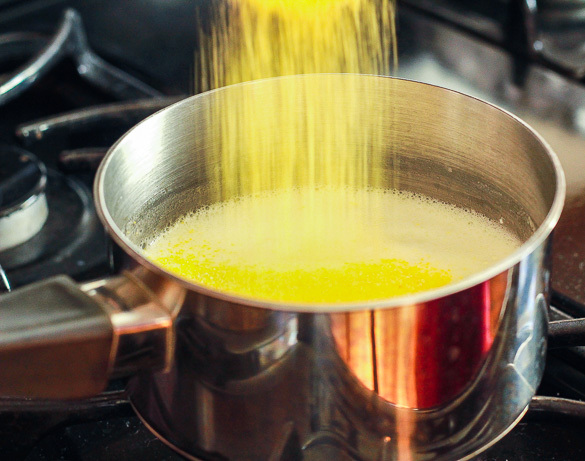 Reduce heat to low and cook, whisking frequently to prevent the polenta from burning. Whisk in the white cheddar cheese and remaining ½ stick of butter. Add more milk if polenta becomes too thick. You want it to be the consistency of oatmeal. Season with Kosher salt and white pepper. Remove from stove and keep warm. Remove the steaks from the zip lock bag and brush aside excess marinade. Season lightly with some SYD Beef Rub. 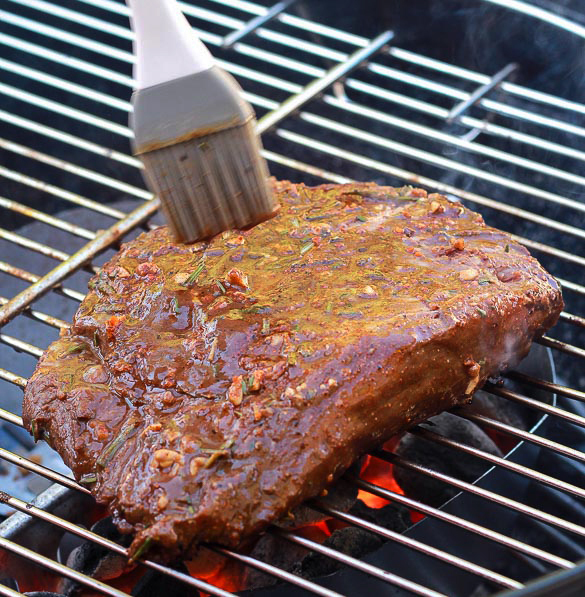 Use a silicon brush to brush excess marinade and move the steaks to the cool zone if there is a flare up. Grill the steak for 4 to 5 minutes on each side for medium rare, about 130F. Remove the steaks from the grill and transfer the steaks to a cutting board, cover loosely with foil and let rest for 5 minutes. Cut the steaks against the grain into ¼-inch slices. To serve, place a nice dollop of the cheesy polenta on a shallow bowl and place the sliced hangar steak on top.